I have an 8 year old girl and with her comes lots of hair accessories. I don't have a master bathroom, and the one bathroom we share is very small. 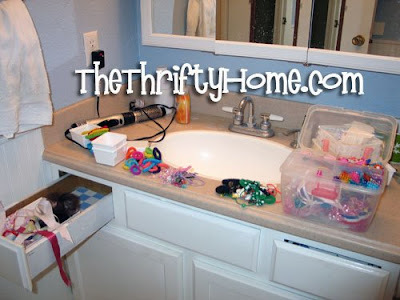 Over the years I tried organizing her accessories in the drawers with organizing trays, I tried using the caboodle, and all sorts of different conventional organizing methods. It would look great after I spent hours organizing, but after a few days of her not putting things back it would be a mess again. 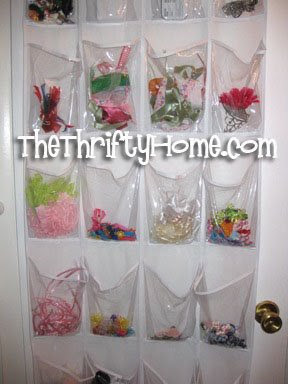 I had been using over the door shoe organizers from WalMart in my bedroom closet for my odds and ends and also in the hall closet for band-aids, thermometer, cough drops and other things that tend to get lost easily. My kids always put the band-aids and other things back in the right place in the hall closet, because they can see where to put them easily. Why not throw a shoe organizier over the back of the bathroom door? Sure I will have to still look at all of her hair accessories, but they will no longer be on the counter and in my way, but organized. Everything fit perfectly and the 2 bottom organizers are bigger and perfect for all of her headbands. Here it is 1 year later, still just as organized as it was when I first organized it. My daughter loves being able to easily see her hair accessories and can easily see where to put them away. I found mine at Walmart for around $5 each. I have 2 in my bedroom closet and use them for lotion, jewlery, and odds and ends. I have one in my hall linen closet and use it for sunscreen, cough drops, band-aids, thermomoters, nail clippers, and other small things that used to get lost in the closet. My kids never ask me where the band-aids and other things are anymore. They can see very clearly everything. My hall closet door is small, so I just folded the last row of pockets back to make the organizer the same size as my door. Visit Org Junkie's Round-Up to see how other people have organized makeup and hair supplies. GREAT idea! as a mother of 3 girls, I LOVE this idea!! Wow...I'm going to look for a couple of those...she can put her hair stuff in a couple of pockets and maybe some of her other stuff in the others! Hah! I do the same thing. Those over the door organizers are the best. I have one on every closet door in my house. That is perfect. I NEED one of those for my daughter's room. Do Webkinz animals fit in those pockets? 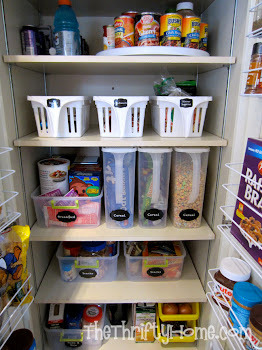 My ten year old is the most disorganized child EVER, this may help! Thanks for linking up and teaching me something today! Great idea. I think I will put one of these in our hot press / airing cupboard (not sure what the equivalent is in US) at our cottage for all those little bits and bobs. 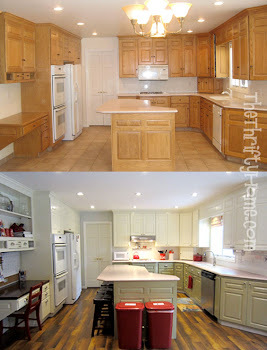 This is a great idea, especially for those with small spaces! Very creative! That's a great way to store stuff- especially the little things that are likely to get lost. Wow. You're the Organizing Queen. I give you the crown for this idea. Great idea! I use the same thing to hold my 2 son's video games and baseball cards! I have one of these on my pantry door and it creates a lot more space. But I just didn't think of using it in the bathroom. What a great idea. What a wonderful idea. 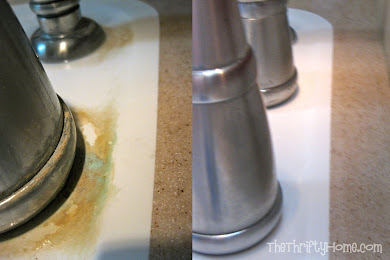 I’m sure many moms are just waiting to stumble across something like this! So great! Those shoe organizers are so versatile, love it! I was just organizing my daughters room and was so frustrated with all the hair things laying around... I just googled organizing hair accessories and up you came with a wonderful idea. This is my first time reading your blog. I am headed out tomorrow to buy an organizer. Love the idea. Thanks so much. I will be reading your blog much more often. Thank you again. It's look like you cover every thing in this Article. This is great and finally got something to learn after roaming around the other blogs. This should keep me busy for a while! Thank you so much.Hope I will get some great stuff soon from you.Great work.